Chia seed puddings with almond milk are an excellent food to make in advance and grab when you’re on the go. This mango Lime Chia Almond Vegan Pudding is easy to make, lasts for several days and keeps you full for hours. Free of dairy and refined sugar. The sweetness of the mango is mixed with zesty lime for a tangy sweet topping. This chia pudding recipe contains 2-3 portions of your recommended 10 portions of fruit and vegetables a day. Chia seeds count towards this as do the almonds if you use homemade almond milk. 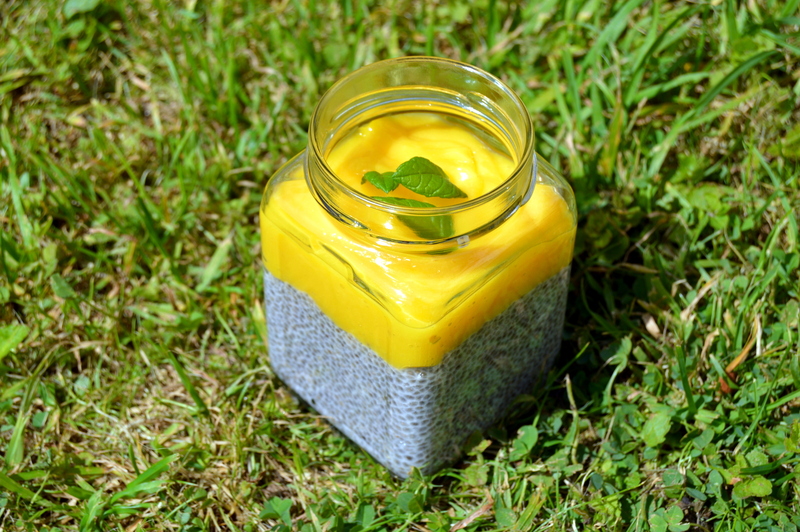 Mango Lime Chia Puddings looks great in an assortment of mismatched jars. They also have the benefit of having an air tight lid that keeps them fresher for longer. These mustard, chutney and jam jars were far too good to have melted down. Maple syrup in this vegan chia pudding is optional. If you’re using a milk that is already sweet enough you may want to taste before adding any sweetener. I think mango and lime work so well in this chia pudding as the mango goes naturally quite thick and the lime cuts through the sweetness and helps to preserve the fruit. If you don’t have mango then use any fruit that you like that isn’t too watery and doesn’t degrade quickly like apple or pear. Plums, kiwi and strawberries work really well in this almond chia pudding recipe. A sprig of fresh mint on top of a Mango Lime Chia Pudding is the perfect topping. Mint adds a subtle flavour to the desert but its mostly there to look great. Chia seeds are a very healthy food as they contain omega-3 fatty acids, rich in antioxidants and contain fibre. Chia seeds also contain iron, calcium and zinc. Be warned a jar with edges makes it more difficult to eat every delicious morsel so you may have to use a finger to finish this chia pudding off. I always try to buy any preserved produce in jars as cans contain unhealthy plastic. Old jars are great ways to transport your food in healthy glass and provide great portion sizes for desserts. See my seed berry cheesecakes where I use jars to prep a healthy nut free and dairy free cheesecake. Mix the dairy free milk, maple and vanilla together. Whisk in the chia seeds and leave 20 minutes for them to gel up for your chia pudding. Make sure there are no clumps of chia. Blend together the mango flesh and lime juice. 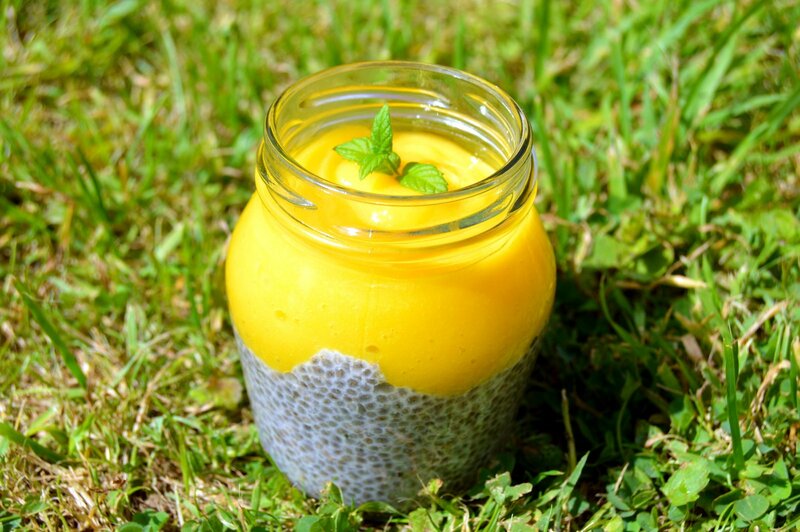 Pour out the chia mixture into 4 pots and then top with the mango-lime coulis to complete the vegan chia pudding. Store the chia puddings with almond milk in the fridge and they will last for a couple of days. If you like this chia pudding check out my chia pudding 4 ways recipe.